I was lucky enough to get into the Wine & Dine Meetup. It was at night so I wouldn't have to take off from work, so it was perfect! It was my first meetup and I was so excited! Cori and I met up with Kristin (A Mom on the Run) and her hubby, Adam. We showed up at the entrance to Epcot to get our shirts and we got another goody too--a fastpass for Test Track! I hadn't ridden the new version so this was a plus! So right after changing into our shirts, we headed over there. After our ride, we headed to the countries for some Food & Wine goodies! I had to get my favorite--the Dragonberry Colada! I also stopped in Canada for the filet with the yummy mushroom sauce! Then we headed over to America. We got in line for a picture with the head Chef himself! Then we got to the food! This was a vegetarian dish with a spicy curry sauce. Not sure who thought it was a good idea to feed runners something spicy before a run. But it was okay. We also had some fruit, veggies, humus, and cookies. Then we listened to some speakers. Darrell Fry, Sports Media Director, and Faron Kelley, Director, Marketing and Communication for Disney Sports started us off. 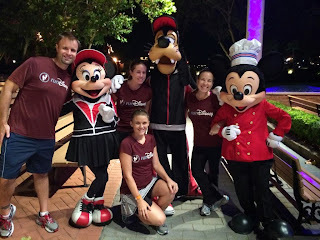 We listened to Jeff Galloway and runDisney nutritionist Tara Gidus. And we learned about some of the food and wine from the countries from some of the chefs and a sommelier. They also had several prizes to be won. 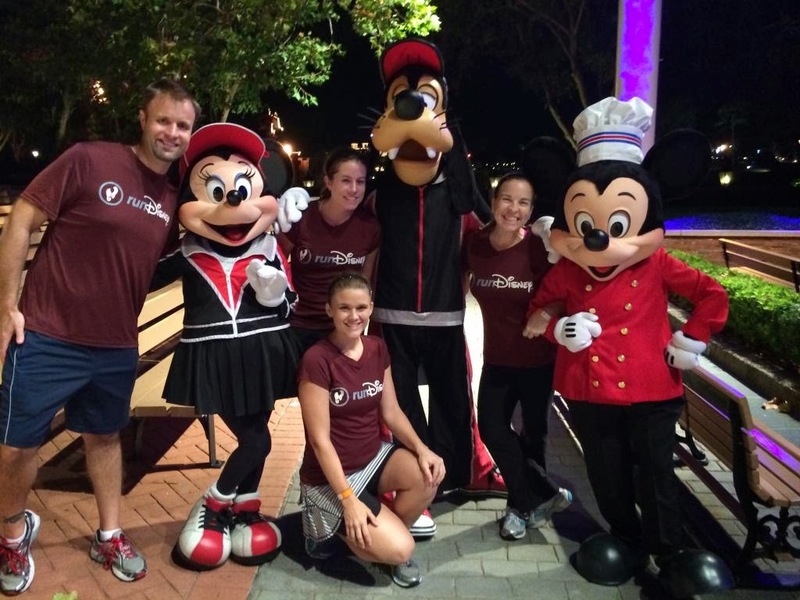 Cori won a free entry into any runDisney race. How lucky! We got to take a picture with same famous people: Minnie, Goofy, & Mickey! Then it was time for the running portion. We usually do run/walk intervals but when I heard that the group was going to be doing something like :20/:20 I knew I couldn't handle that much starting and stopping. Cori was worried about the straight running pace so I asked and they said it would be a slow 11ish minute pace. Well, it turned out to be about a minute faster but we kept up the whole time! We ran around the countries once and then back to in front of the fountain where we stopped for some pictures. 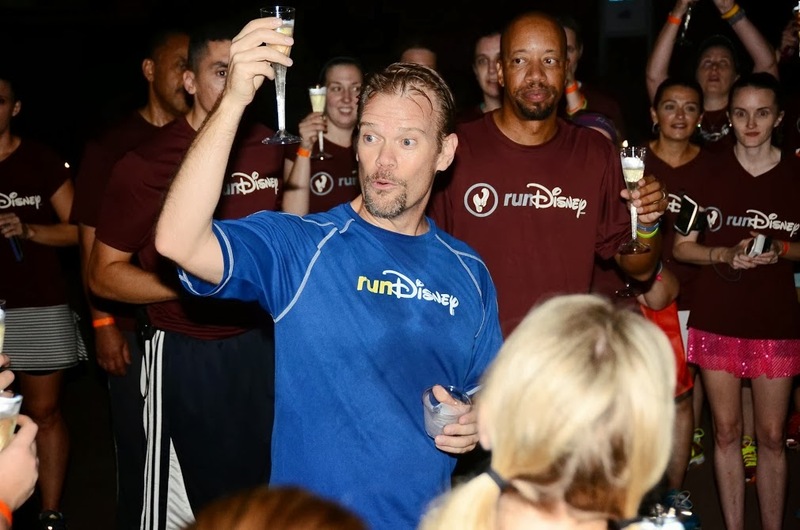 Then we ran to in front of Spaceship Earth where they had special champagne toast for us! I forget the exact toast but it went something like "May the road rise up to meet you. May the wind always be at your back. May your splits be negative. And your miles be magic." Something like that. Anyways, it was great! 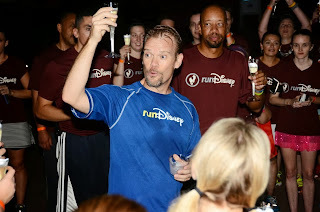 I had so much fun and hope I get to participate in another runDisney Meetup!